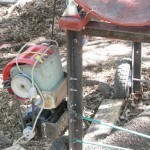 “I had need for about 6 cubic yards of broken stone to level a steep area on my property. Because rain water flowed through the area, I wanted just stone, no dirt to impede the water flow. I have about 1500 cubic yards of broken shale and soil available if I could just screen out the dirt. 2-24 inch id bicycle rims bolted to the drum. ½ inch mesh wire cloth. To keep the drum bicycle rims running in the casters, I used the drive belt on the motor/outlet end and a long v-belt bought from home depot for $1.99 on closeout at the inlet end. I didn’t want to throw the dirt and stones; I wanted them to slide down the screen as they moved toward the outlet. I made the screening opening 24 inches long so the dirt would fall down into a wheel barrow or garden tractor trailer and the stone would fall out the end, also into a wheelbarrow or trailer. I installed the 2 side deflectors so the screenings would only drop straight down and not on the casters or frame of the machine. I later added four easily removable wheels for ease of movement. 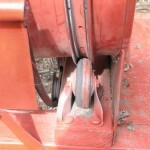 The barrel is tilted by having the inlet end casters raised on a 2×4. 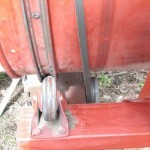 The barrel is 35 inches long, the machine is 48 inches long. I originally cut 4 windows in the barrel for the screenings to fall through, added the steel bars and cut out the spaces between the windows to get a full circumference for screening. As soon as I get an other barrel, I’ll simply cut it in half and use the bars to space the halves 24 inches apart, making it 59 inches long. That way I’ll have more space to toss the material in and more overhang on the outlet end to make it easier to position the trailer or wheelbarrow. A big thanks to Ken for sharing this with us! If you have any questions or comments please post them below. Also, if you want to make an article submission for our site please comment below. I FORGOT TO MENTION THAT BY SIMPLY LOOSENING THE BELTS AND SLIDING THEM OFF THE DRUM, THE DRUM COMES OFF SO THE MACHINE FITS NICELY IN A VAN. I am incredibly impressed with this rotary trommel screen. I have built my own (with a few modifications that makes it a little more heavy-duty and a little safer) but I am not good picking motors it seems. What’s a good HP motor to use? I can dial down the speed with a dimmer switch if I go over, but I have burned out a used 1/3 & a 1/2 HP swamp cooler motor so far. 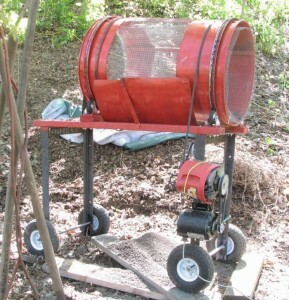 MY RED ROTARY TROMMEL, SHOWN, IS POWERED BY A 1/4 HP 120 V INDUCTION MOTOR, THE 55 GALLON DRUM SPEED IS ABOUT 27 RPM, GIVING A SCREEN SURFACE SPEED OF ABOUT 175 FEET PER MINUTE. 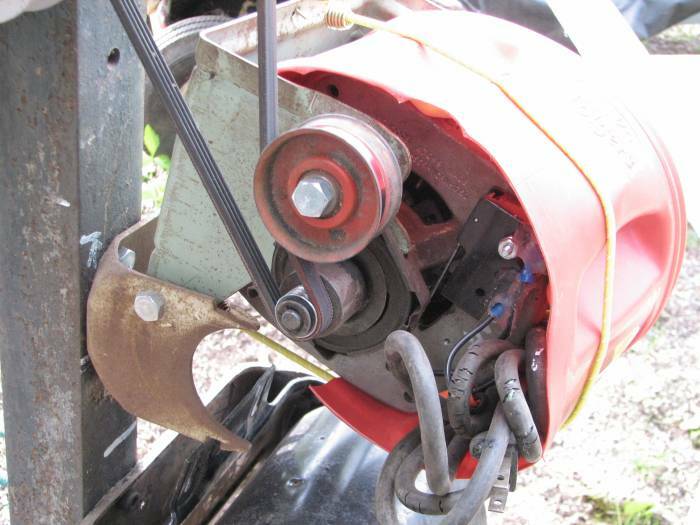 USE BELTS AND PULLEYS TO REDUCE THE SPEED, RATHER THAN REDUCING THE MOTOR SPEED ELECTRONICALLY. DRILL MOTORS COULD BE USED, BUT THE MOTOR NEEDS SPEED TO FAN COOL ITSELF. CLOTHES DRYERS RUN THAT SPEED TO ALLOW AIR TO GET TO EVERY AREA AS WELL AS TO FLUFF IT. 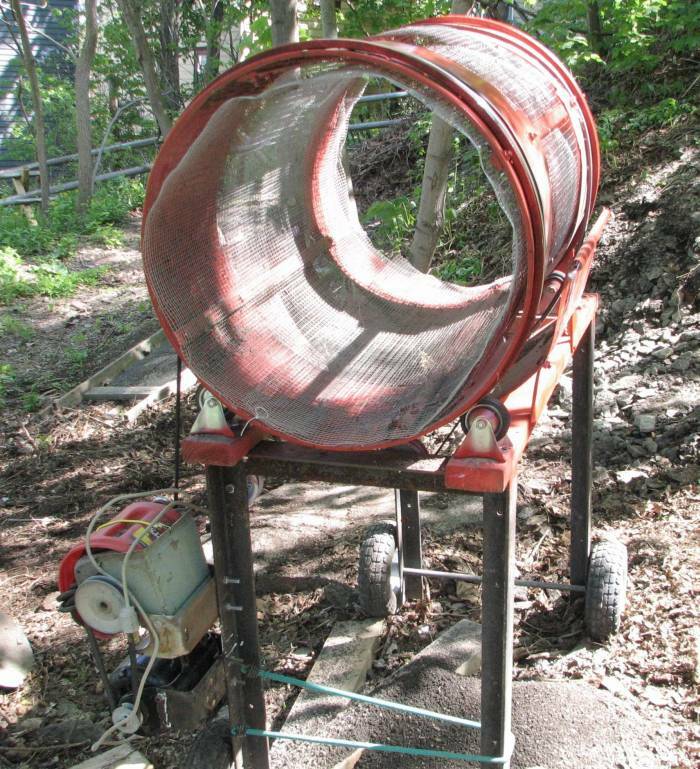 I WANTED A SPEED THAT WOULD RAISE THE STONE ABOUT HALF WAY UP, SO IT WOULD SLIDE DOWN AND GRIND ANY CLUMPS OF DIRT. THE LOWER SPEED ALSO REQUIRES LESS POWER. IN IT’S FINAL FORM, THE 1/3 HP MOTOR IS USED AS AN IDLER SHAFT AND IS DRIVEN AT ABOUT 1/2 SPEED BY THE 1/4 HP MOTOR. IF YOUR DRUM IS LARGER THAN THE 55 GALLON DRUM, YOU MIGHT NEED MORE THAN 1/4 HP ONLY IF YOU ARE FEEDING THE DRUM FASTER THAN ONE MAN SHOVELING. MANY COOLER MOTORS ARE SHADED POLE MOTORS THAT ARE ELECTRICALLY INEFFICIENT, HAVE LOW STARTING TORQUE AND NEED TO RUN AT FULL SPEED FOR THE COOLING FAN TO MOVE ENOUGH AIR TO COOL IT IF RUNNING AT FULL LOAD. 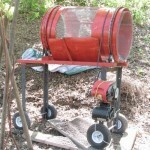 I love this idea of a rotating trommel as I have a large area of garden to clear of weeds, broken glass, stones and bits of cars in our new house’s garden. How can I improve on this to help clear such a large area to a depth of around 12 inches? The garden is 80 yards by 40! 40×80 YARDS 1 FOOT DEEP TOTALS 1067 CUBIC YARDS, ABOUT 90 TIMES WHAT I ENDED SCREENING. I DID ALL THE SHOVELING BY HAND, MOVING THE MATERIAL BY GARDEN TRAILER AND LAWN TRACTOR, PLUS THE POWERED WHEEL BARROW I ENDED UP BUILDING. THERE WAS NO RUSH IN COMPLETING THE JOB, SO MY ROTARY SCREENER WAS FINE. 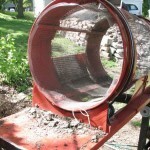 IT WAS ALSO USED FOR MANY HOURS BY TWO OTHER HOMEOWNERS WITHOUT A CHANGE OF THE 1/2″ MESH SCREEN. 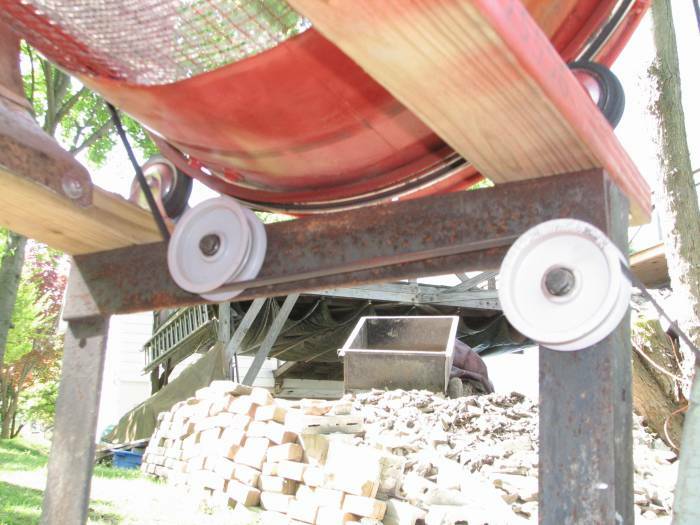 FOR A 1000 CUBIC YARDS, IF I COULDN’T RENT A COMMERCIAL SCREENER, AND I WANTED A SHORTER COMPLETION TIME,I WOULD HAVE BUILT A COMMERCIAL STRENGTH SCREENER WITH LARGER WHEELS FOR THE DRUM SUPPORT WITH A VERTICAL AXIS WHEEL TO KEEP THE DRUM IN PLACE. 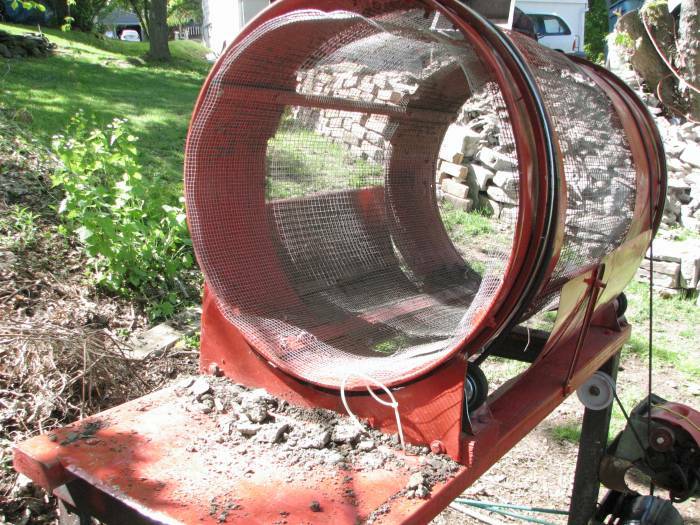 I WOULD HAVE USED USED 1/2 INCH EXPANDED METAL FOR THE SCREEN, LONGER BARS SEPARATING THE DRUM HALVES, AND A FEEDER CHUTE THAT COULD ACCEPT MATERIAL FROM A BACK HOE OR FRONT LOADER. THE DRIVE MOTOR IS A SPLIT-PHASE MOTOR WITH A STARTING SWITCH TO CUT OUT THE STARTING WINDING WHEN IT APPROACHES 75% TO 80% OF FULL RUNNING SPEED. FULL SINE WAVE AC POWER IS REQUIRED TO START AND RUN THE MOTOR. 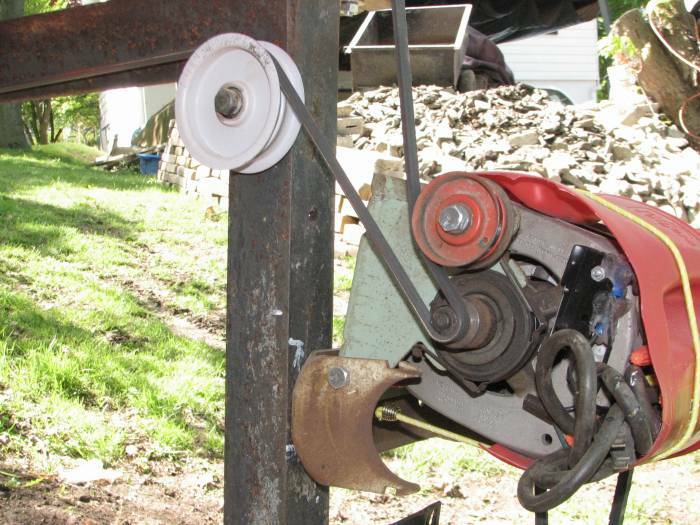 STARTING TORQUE IS GREATER THAN RUNNING TORQUE, NECESSARY TO BRING A STOPPED LOAD UP TO SPEED. IF THE MOTOR IS RUN ON REDUCED VOLTAGE, ITS POWER IS REDUCED DISPROPORTIONALLY. 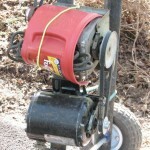 THEREFORE, THE MOTOR WILL NOT BE ABLE TO START AND DRIVE A LOAD REQUIRING FULL POWER. AT THE SAME TIME, REDUCING THE VOLTAGE REDUCES THE SPEED AND THE BACK EMF GENERATED, CAUSING EXCESS CURRENT DRAW AND EXCESS HEAT, JUST AS THE FAN IS RUNNING SLOWER AND NOT PROVIDING COOLING. 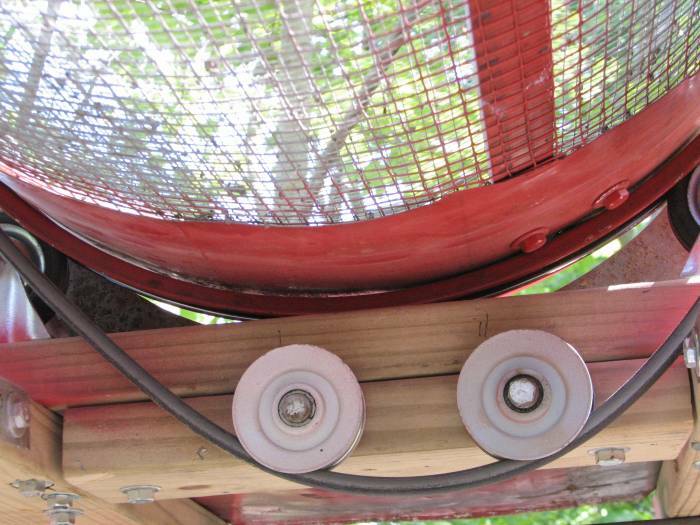 CEILING FAN MOTORS ARE SHADED POLE MOTORS WITHOUT STARTING SWITCHES. THEY ARE IMPEDANCE PROTECTED AND WILL NOT DRAW MORE CURRENT AT REDUCED VOLTAGE. THEY HAVE VERY LOW STARTING TORQUE, ONLY REACHING FULL TORQUE AS THEY REACH THEIR RATED RUNNING SPEED. LIKEWISE, AT REDUCED VOLTAGE, SPEED, TORQUE AND DEVELOPED POWER ARE MUCH REDUCED., THIS IS OK FOR FANS THAT DRAW LESS POWER AT REDUCED SPEED. i was thinking it was a more of a updated motor. . dont having 2 moters make one on them stall or causes wear on the smaller on becouse its tring to hold the other one back. 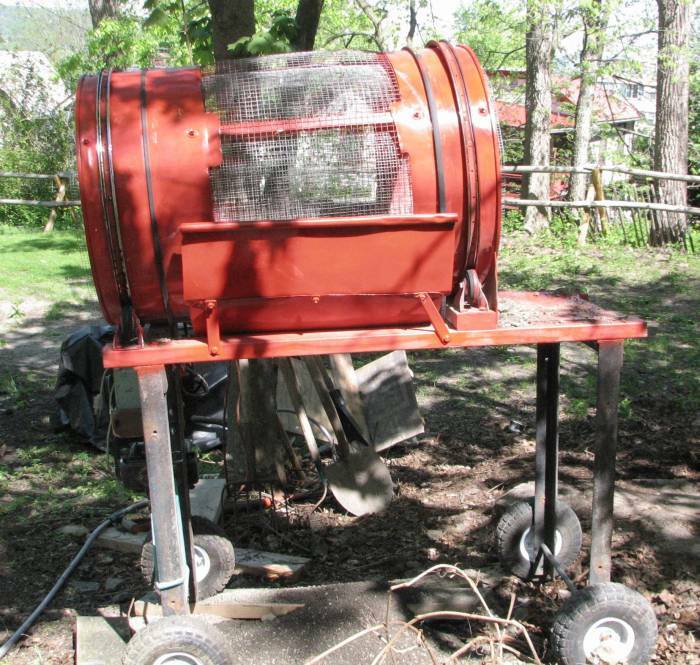 I am considering this project, my initial thoughts are to use a treadmill motor. if your are patient these seem to be offered for free when people give up running or the belt slips. at anyrate they are adjustable speeds and you can then determine what speed with out the risk of burning out the motor or the hassle of extra belts. 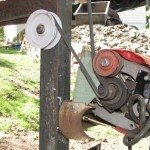 I currenty use one on my lathe and its great. I love the trommel. 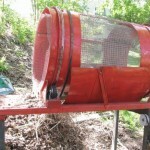 I need one, I had made a tilt screener years ago, to screen my mulch, compost, etc. 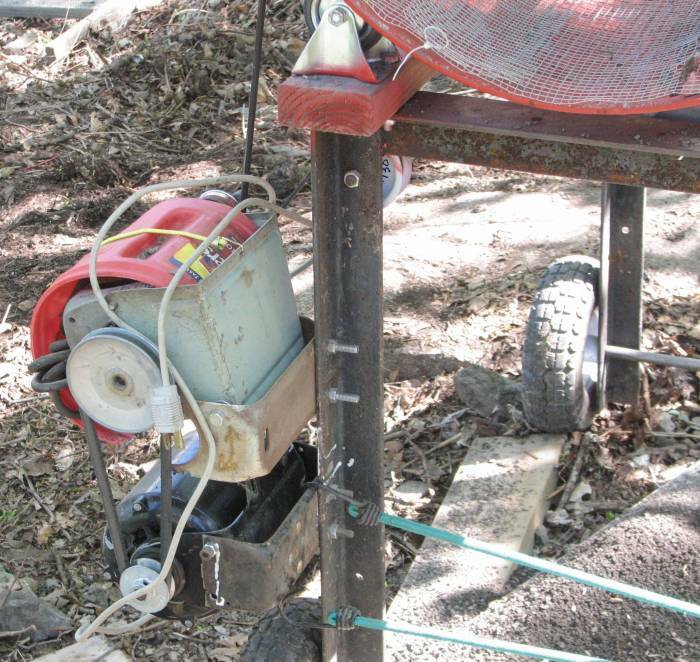 used it to clean stones too, but was a lot of work, property got done, screen, which was 4′ X 8′ , bolted to black iron pipe, which was bolted between 2 trees about 6′ apart, just got lost amongst other old home made tools & eventually got discarded. Now that property is getting older, & I am doing new work, I am taking up yards & yards of old decorative stone. At this point, I am piling it in backyard area, because it is mixed with old weedblock fabric, dirt, soil, sand, topsoil, etc. 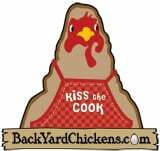 I need a trommel to clean & screen the decorative stone so that I can use it again on the reclaimed, or newly claimed portions of my property. 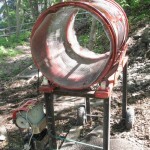 I need to get a trommel, but dont know if I have the time, ambition, patience to build my own, like the one in the video above. Where can I buy one, or who would be willing to build oe for me? I am nearing retirement, & I figure that I can just work a little longer doing work I know how to do, so that I can earn the money to pay someone to build the trommel ( which I dont know how to do ) If I do the math, it makes sense to pay someone to do what they know how to do, with money that I make doing what I know how to do. Any takers ?? Any Ideas ?? I wonder if it’s possible to convert this basic drum and base setup to be powered by an old bicycle? Run a large belt off the back wheel of a stationary bike with the tire removed. 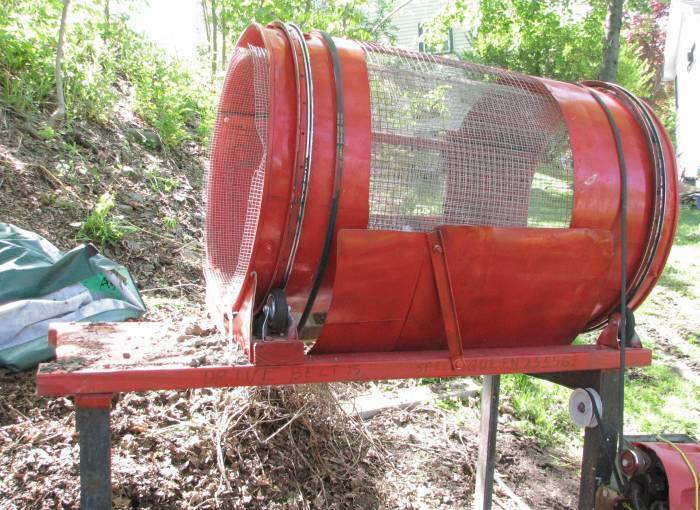 One person ‘rides’ the bike to turn the trommel while another shovels the compost. THE DRUM SPEED SHOULD BE NO MORE THAN 30 RPM, IT CAN BE SLOWER. A BICYCLE WHEEL USUALLY HAS A RUBBER STRIP TO PROTECT THE INNER TUBE FROM THE SPOKES. USE A BICYCLE RIM WITH THE RUBBER STRIP ON THE DRUM AS A DRIVEN PULLEY, THAT WAY YOU CAN USE A LENGTH OF ROPE INSTEAD OF AN EXPENSIVE BELT. THE SPROCKETS ON A BICYCLE WHEEL ACT TO MAKE THE WHEEL SPIN FASTER THAN HE PEDALS. YOU REALLY ONLY WANT THE WHEEL TO GO NO FASTER THAN THE PEDALS, SO A SMALLER WHEEL ON THE BICYCLE WOULD BE BETTER. THE LOWEST GEAR ON A MOUNTAIN BIKE MIGHT WORK, TOO. I still have my son’s old 12 inch bike and my wife’s old 26 inch single gear beach cruiser. I think i could modify the small bike to make a hand crank with the pedals OR mount the bigger bike on a stationary frame and actually ride it with the small 12 inch wheel on the back using the 26 inch rim as the drive pulley on the barrel of the trommel. Would using braided nylon rope work best or would clothes line rope/wire be a better choice? 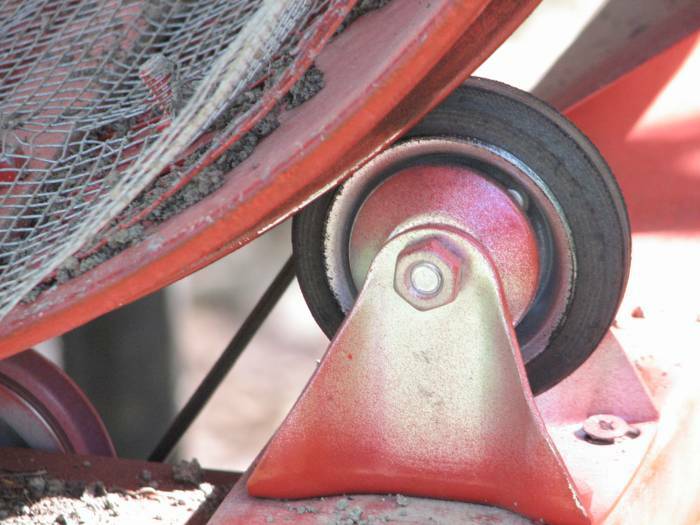 Should there also be some type of tension pulley between the wheel and barrel to keep the rope tight on the barrel and the wheel? I have a nasty-bad shoulder injury and this project would help immensely with all the soil we need sifted for our family garden relocation (the pine tree in the back yard took over all the sunlight and we to move everything to the front yard). The front yard is nothing but weeds and hard pan with lots of gravel mixed in. 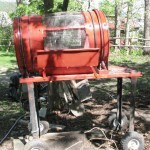 I’m also building a double barrel compost tumbler and this would also help screen the compost for the garden beds. And thank you for your response, it was nice hear back so quickly and I’m glad there are people out there like you that actually want to help others in need of advice. Thanks again for your feedback. THE 12 INCH WHEEL ON THE LARGER FRAME SHOULD BE GOOD. THE BEACH CRUISER FRONT SPROCKET SHOULD BE AS SMALL AS POSSIBLE, THE FEWER TEETH THE BETTER. THE 12 INCH BIKE CRANK SPROCKET IS PROBABLY SMALLER AND MIGHT INTERCHANGE. 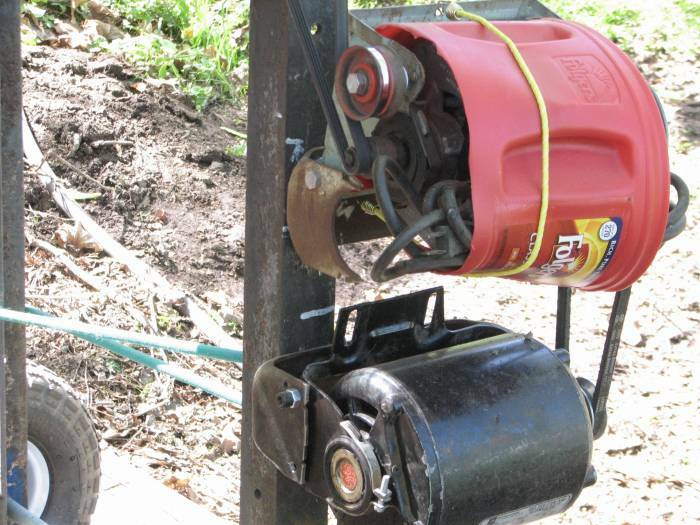 YOU DON’T WANT TO HAND CRANK, YOU HAVE MUCH MORE POWER AND ENDURANCE USING YOUR LEGS, AND WON’T RISK TORQUING YOUR BACK OR TRASHING YOUR SHOULDER. 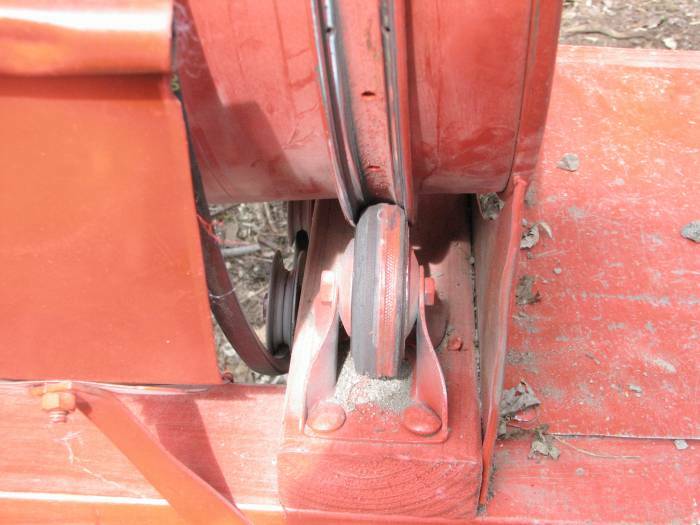 YOU COULD USE THE FRONT RIM OF THE 12 INCHER WOULD MAKE A GOOD TENSIONING IDLER, MOUNTED ITS FRONT FORK AND WEIGHTED OR SPRING LOADED. YOU WANT A ROUGH ROPE THAT’S NOT SLIPPERY, SISAL OR HEMP SO YOU NEED MINIMUM TENSION TO TRANSMIT POWER. 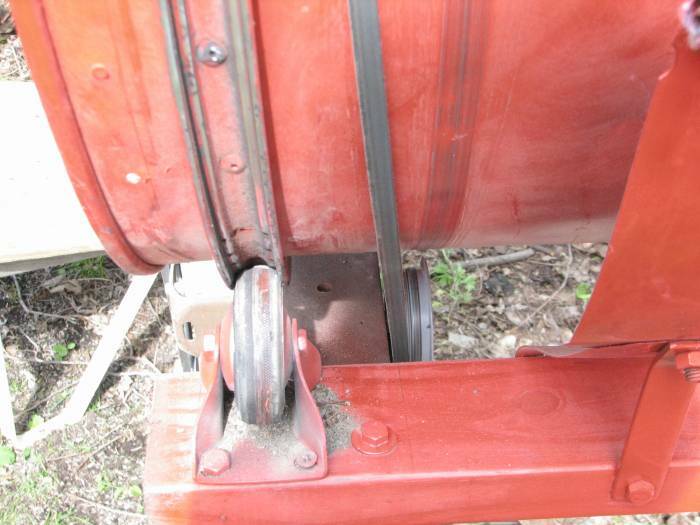 COUPLING THE ROPE ENDS BY BRAIDING WOULD MAKE THE MOST SUPPLE SPLICE. 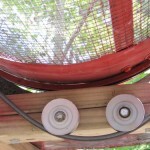 SEE: http://www.neropes.com/Splicing%20Guide%20Individual%20Splices/3_st. OR OTHER SITES YOU CAN GOOGLE ROPE END-TO-END SPLICE. I’LL PROBABLY FIGURE OUT SOME OTHER APPROACHES AS QUESTIONS ARISE. 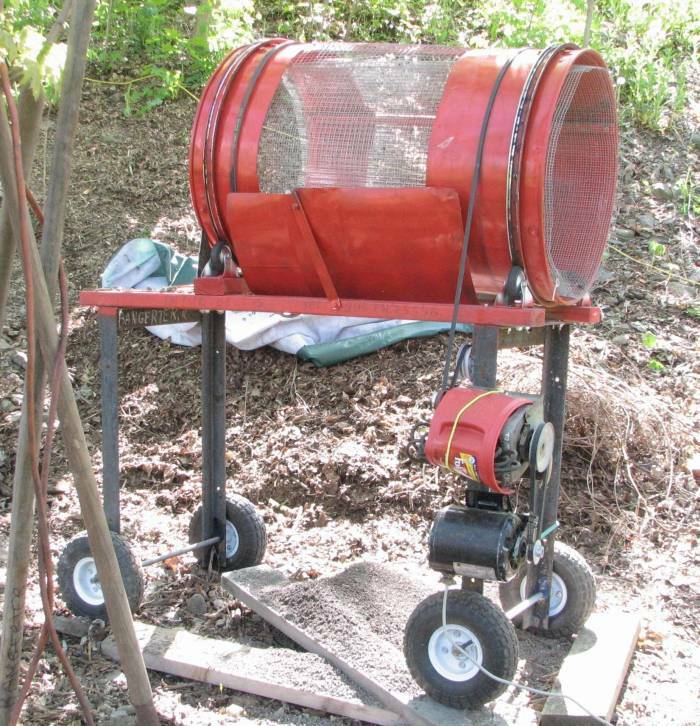 IF YOU HAVE ELECTRICITY HANDY, CONSIDERING THE EFFORT NECESSARY TO BUILD THE BICYCLE POWERED TROMMEL, YOU MIGHT FIND IT EASIER TO BUILD A MOTOR POWERED ONE, USING THE MOTOR AND BELT FROM A JUNKED CLOTHES DRYER. THE DRYER MOTOR HAS A SHAFT AT EACH END, ONE END WITH THE TINY PULLEY FOR THE MULTI RIBBED BELT, THE OTHER END BEING A 1/2 INCH DIAMETER SHAFT MOUNTING THE BLOWER WHEEL. 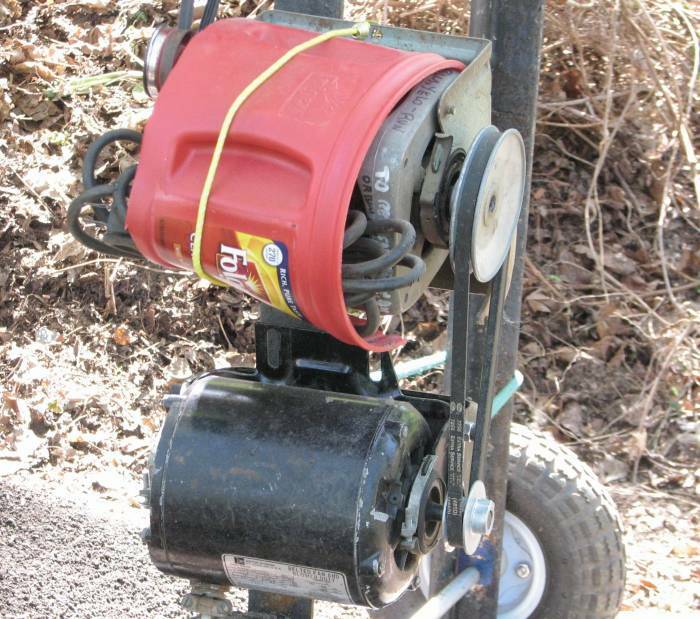 THE MOTOR WILL SPIN THE DRUM ABOUT 50-60 RPM, TOO FAST FOR A 55 GALLON SIZE DRUM. YOU WANT ABOUT HALF THAT SPEED, I SIMPLY USED THE DRYER MOTOR AS AN IDLER SHAFT AND DROVE IT WITH A SECOND MOTOR USING A 3 INCH TO A 6 INCH V PULLEY AND “A” BELT. 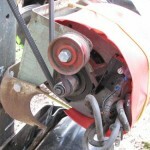 YOU COULD ALSO DRIVE THE IDLER MOTOR WITH A 1/2 INCH ELECTRIC DRILL, IT’S JUST NOISIER. YOU COULD ALSO DRIVE IT WITH A BICYCLE, OR MAYBE YOU CAN ACQUIRE AN EXERCISE BIKE ON FREECYCLE, IN ITHACA, NY WE USE: http://groups.yahoo.com/group/IthacaFreecycle/, THERE MUST BE ONE IN YOUR AREA. I WAS JUST CHECKING NIFTY-STUFF AND REREAD YOUR QUESTION ABOUT THE ROTARY TROMMEL AND WONDERING IF YOU HAVE BUILT ONE FOR YOURSELF. IF YOU HAVE, I AM INTERESTED HOW YOU BUILT IT AND HOW IT WORKS. Looking to make one, although I wondered if you would be willing to sell yours? Is there anywhere that sells these for homeowners and DIY’s? Would like to look at one for our remote cabin in Alaska. THERE MUST BE EMPTY 55 GALLON DRUMS AVAILABLE CLOSER T O YOUR CABIN. 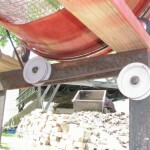 THE PICTURES AND ARTICLE SHOULD BE ENOUGH TO COPY THE DESIGN AND ALL ANGLE-IRON PARTS WOULD WORK AS WELL MADE OF WOOD. (i FOUND THE ANGLE-IRON LEGS, OTHERWISE I WOULD HAVE USED WOOD. 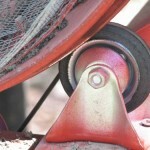 )THE BICYCLE RIMS SHOULDN’T BE HARD TO FIND AND THE DRUM ROLLS ON CASTORS. THE BICYCLE RIMS ARE NOT REALLY NECESSARY IF YOU USE A CASTER OR A WHEEL MOUNTED HORIZONTALLY ON A CROSSBAR BEARING AGAINST THE DISCHARGE END OF THE DRUM TO KEEP IT IN PLACE. ACTUALLY, THAT’S A BETTER ARRANGEMENT ANS THE CASTERS RUNNING IN THE RIMS TEND TO WEAR IN A COUPLE OF HUNDRED HOURS. 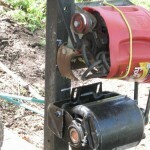 IF YOU USE CASTERS, BUY SEVERAL SETS FOR FUTURE MAINTENANCE.